Science is such a fun subject to learn! If you have kids that love science, then you should try teaching them all about chemistry using hands-on chemistry experiments. You can use chemistry experiments to give them hands-on practice as they learn this important but fun subject. Chemistry is all about studying matter. Everything is made out of matter, which means chemistry applies to everything around us! 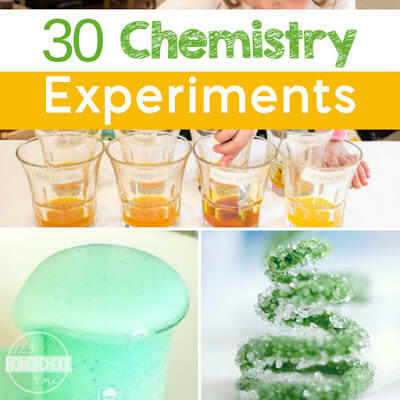 In order to help your kids learn about chemistry, you can use experiments to make it more exciting and hands-on. Chemistry doesn’t need to be super complicated or difficult. Use these fun and easy chemistry experiments to teach your students the basics about chemistry. Simple Chemical Reaction Experiment – It’s fun to watch how different compounds react with each other. That’s what makes this simple chemical reaction experiment so fun! Fluid Science Experiment – This experiment will give your students a great visual for how chemistry works. They’ll enjoy experimenting with different fluids, comparing reactions for each. Fun Bubble Experiment – What’s not to love about bubbles? 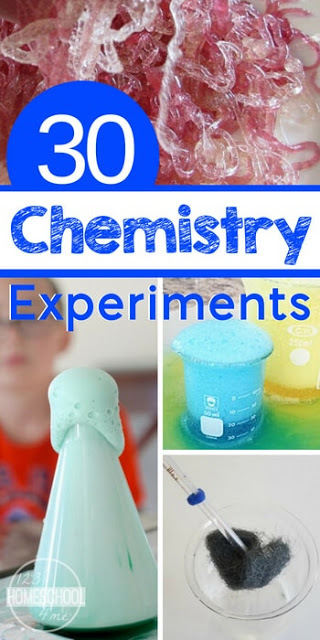 Your students will learn so much about chemistry with this experiment, all while having fun! Diffusion Watercolor Art – Chemistry can be found anywhere, including art. This chemistry experiment will highlight this fact as your students create a masterpiece. Color Changing Acid-Base Experiment – What’s the difference between acid and base? Your students will enjoy discovering the answer with this chemistry experiment. Water Balloon Science Experiment – Your students are sure to love this fun chemistry experiment. They’ll learn all about density while playing with water balloons. Erupting Volcano Slime – Who doesn’t love a good volcano experiment? With this activity, your students will get to have fun creating a volcano while also studying chemistry. Balloon, Baking Soda, Vinegar Science Experiment – What happens when you mix baking soda and vinegar? Find out with this chemistry experiment. Water Chemistry Experiment – What can chemistry tell you about your water? The answer is: A LOT! Super Simple Chemistry – Help your students learn the basics about chemistry with this experiment. Color Changing Chemistry Clock – Use chemistry to make these liquids change colors! Erupting Rainbow Experiment – How can you make an erupting rainbow? Find out with this science experiment. Hatch Baking Soda Dinosaur Eggs – Chemistry will help you hatch these dinosaurs. Cleaning Pennies with Vinegar – Do you have any dark and dirty pennies lying around? Let your students use this chemistry experiment to clean them up! Chemistry can be delicious! You just need to know what to do. Here are a few chemistry recipes you won’t want to miss. Homemade Butter Science Experiment – Did you know cooking requires a lot of chemistry? Teach your kids this fun fact with this hands-on experiment. Kitchen Chemistry – Chemistry is all around us, especially in the kitchen! Have fun experimenting with chemistry while baking a delicious cake. Green Eggs Chemistry Experiment – The next time you ready Green Eggs and Ham, make sure you add this fun chemistry experiment to your list of things to do. Food Chemistry: Turn Juice Into A Solid – Turning juice into a solid is a fun chemistry experiment you can do in your own kitchen! Acids and Bases Experiment – You can use items from your kitchen for this chemistry experiment. Your students will learn all about acids and bases. Exploring Butter Chemistry – Here’s another chemistry experiment that can also be tasty! Rock Candy – Now you can explore chemistry while making a yummy treat! Use this chemistry experiment to grow rock candy. Erupting Lemon Volcano – You can use simple ingredients in your kitchen to make this erupting volcano! You can also use chemistry to make the holidays extra fun! 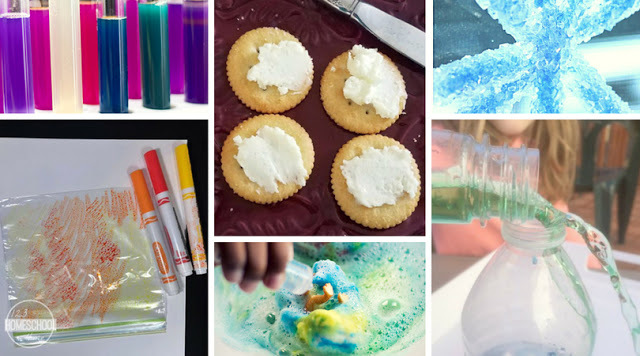 These experiments are sure to make the different holidays more fun, from leprechaun rocks to Valentine’s Day love potions. Leprechaun Rocks – Combine chemistry and St. Patrick’s Day with this fun experiment. Kids will get hands-on science practice while also celebrating St. Patrick’s Day. Create Wizard’s Brew or Witch’s Potion – This chemistry experiment is sure to get your students ready for Halloween! They will use chemistry to create a magical brew or potion. Snowman Chemistry – Get ready for the holiday season with this fantastic chemistry experiment. Gingerbread Man Chemistry Experiment – Use chemistry to make this delicious holiday treat. Winter Chemistry Experiment for Kids – You can use pipe cleaners to create crystal sculptures for the winter season! Crystal Hearts Valentine’s Day Experiment – Nothing says “Happy Valentine’s Day” like a fun chemistry experiment. Love Potion – Make Valentine’s Day extra delicious with this tasty chemistry experiment. STEAM Christmas Tree Activity – This chemistry experiment can double as a Christmas decoration! Hands-on learning is the way to go when it comes to chemistry. These chemistry experiments make it easy for your students to learn what they need to know about chemistry.